It's draft clean up week! I have a bunch of drafts and half started posts. So time to get them out of my queue. I have posted some of these pics last month, but I have a few left over. If you can, please stop by Michael Dooney's Deviant Art page for more. Perfect for Mysteries of the Hollow Earth or Leagues of Adventure. 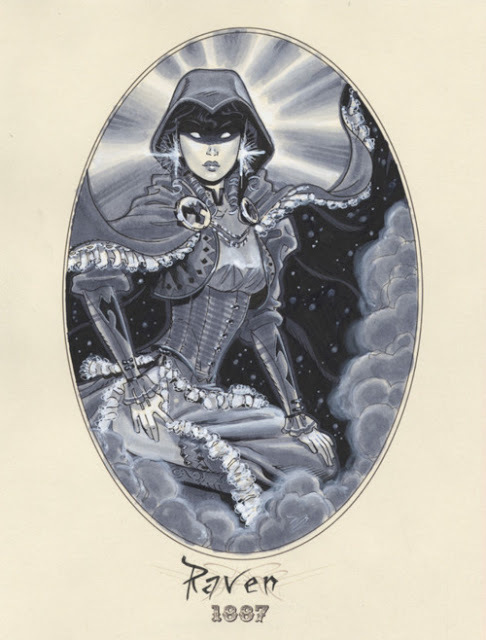 The young woman known as Raven is bit of mystery to other members of the League. Lady Zatanna does not trust her. Her command of magic is not as great as Zatanna's, but what she does know she commands with brutal efficiency. Raven guards her secrets well. While she does wish to aid in the fight against evil she has more at stake than the others. For she is the daughter of the Devil himself.